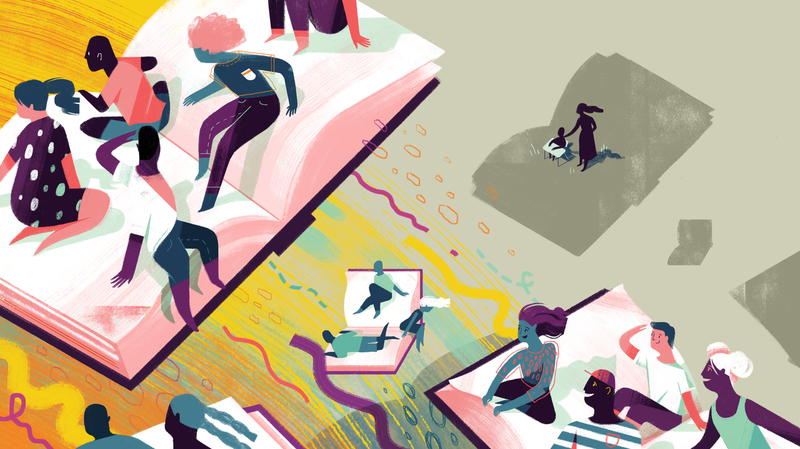 Why So Many Gifted Yet Struggling Students Are Hidden In Plain Sight : NPR Ed "Twice-exceptional," or 2E students, find that one of their sides sometimes masks the other. Psychologist Scott Barry Kaufman says there are a lot more of them than you might think. Scott Barry Kaufman was placed in special education classes as a kid. He struggled with auditory information processing and with anxiety. But with the support of his mother, and some teachers who saw his creativity and intellectual curiosity, Kaufman ended up with degrees from Yale and Cambridge. Now he's a psychologist who cares passionately about a holistic approach to education, one that recognizes the capacity within each child. 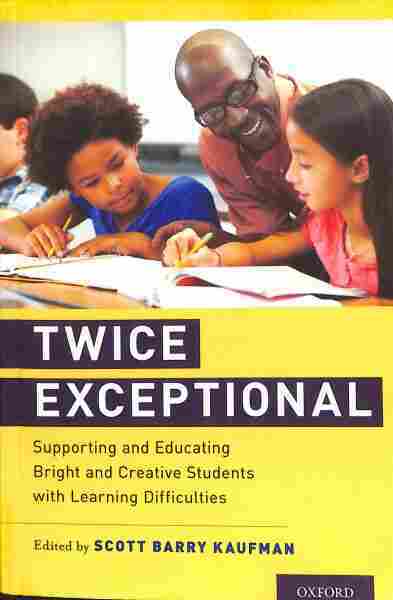 He recently edited a volume of experts writing about how to reach students like himself: Twice Exceptional: Supporting And Educating Bright And Creative Students With Learning Difficulties. I spoke with him about ways schools and teachers can help these twice exceptional, or "2E," students thrive. Our conversation has been edited for length and clarity. So these are students with exceptional, far-ahead-of-the-curve intellectual ability, but who also struggle with a learning disability or difficulty. And as the authors talk about in the book, these students are found all over the place — in special ed, gifted, and in general education classes, too. That's right. The disability can be masked because they are functioning so high, or their disability may dominate, or each can mask the other. Why is this group of students flying so under the radar? Society still has this false dichotomy of, you're a superior human being or a weak loser with bad genes. This is a loss of a critical resource — students who don't graduate, don't pursue higher ed, become unemployed. What do you mean by learning difficulties? I want to be quite inclusive. You have the learning disorders — ADHD, autism, dyslexia — but I wanted to actually expand it to mental illnesses, like kids at risk for bipolar disorder, schizophrenia and depression — a really serious issue in our world today. We need a framework that incorporates them into this more positive psychology movement where we see greater potential. And on the other side, you also have an expansive definition of giftedness — talk about that. I talk about the 4 C's: capacity, competence, creativity and the fourth C is commitment — a higher purpose or a cause or a personal project that you believe in over the long term, like social activists. This is important because you shouldn't have to have a certain threshold on an IQ test to be able to make the world a better place. The subtitle talks about bright and creative students with learning difficulties. Why do you single out creativity there? I think we haven't fully come to terms with the fact that sometimes the things that we value in education, like expertise and intelligence and knowledge, conflict sometimes with creativity. Creativity is just as important, and if we focus on intellectual power we're going to miss out on a lot of these kids that are going to really shake up the world, really change things. Even at the neurological level, when you look at the brain [activity] of high IQ individuals, the network resembles someone who's really good at focusing, concentration, ignoring distraction. With the creative person, sometimes you see the exact opposite pattern — the person who's open to new experiences, they can integrate seemingly disparate things. So different kinds of intellectual abilities can be in tension with each other. Let's say you suspect you have a kid like this. What do you do? Some people say, "Oh, my child is smart, I'm going to fight for them to get into gifted classes," but maybe that's not always the right fight. If you're seeing extraordinary creativity, you can help them find the right match in after-school activities or things outside of school. My mom signed me up for everything, to see what I would be interested in. With commitment, I would really encourage your child to pursue that with full vigor and offer resources. Try to find a mentor in your community and help them get involved. You do see cases where, when you get them involved in something where they feel good about themselves, it's almost like they forget to be disabled. Like Matt Lerner at Stony Brook University, who's done research putting kids with autism into improv classes. Instead of saying, "You have a social deficit," it's saying, "We think you have great potential for some social creativity because you really think differently and you tell the truth." Can a disorder really be that situational? Well, anxiety is a big commonality among everyone on the twice-exceptional spectrum. It's in so many ways conditional. It emerges from the interaction of their learning difficulties and the way they're being treated in school. What about teachers? What can they do to support students like this? Schools can respond in a number of ways. Teachers can take responsibility. Just being trained in the characteristics of twice-exceptionality, that's a huge leg up. And what are some specific characteristics to look out for? I have a TEDx talk about this. You'll see someone who has a great number of both strengths and challenges. A huge vocabulary, curious, great problem solver, wide range of interests, but also high anxiety, easily frustrated, argumentative and sensitive to criticism. I remember reading about studies showing a link between dyslexia and entrepreneurship. Yes. They might be low in capacity but high in commitment and competence. They might have uneven social skills, or be highly gifted verbally but not in math. If you look at total IQ scores, that's not where the real information is. It can mask someone who's extraordinarily gifted in visual-spatial skills, for example. What I'm hearing is that this population is basically defined by heterogeneity. Which makes it hard to generalize about best practices, doesn't it? I make the argument in this book that you should be screening for learning disabilities in both gifted and, of course, general education. I am such a firm believer in a holistic education. We need a humanitarian approach. The more we can learn about a whole person the more we can help them grow. I think that's the larger point there. There's a chapter in the book by Joy Lawson Davis, about race and twice-exceptionality. Talk about that. Gifted education is still virtually entirely white. Do you want to make the argument that that's the truth of the world? That's obviously not the case. There's obviously more going on. For gifted programs that still rely on teacher nominations, they tend to be picking the white ones. For culturally diverse gifted learners, some behaviors may be seen by classroom teachers as a deficit in need of correction, that in a white person would be interpreted as creativity. Jonathan Plucker published a report called "Talent On The Sidelines" showing there's a widening gap in excellence between whites and blacks at the upper end of the achievement spectrum, as measured by achievement gaps. We clearly still have a long way to go in understanding all of the causal factors at play here, and helping all students reach their optimal potential. So this seems to be related to so many other conversations we've been having about diversity and difference and how different identities intersect in the classroom and beyond. What I came out of this with is a sense of how left behind and in the cracks these kids are, how serious this is. I think at the heart of the 2E movement there's something deeper. We're getting at the heart of, what does it mean to grow up in a society on the margins? It's something more profound about humanity and ostracism.